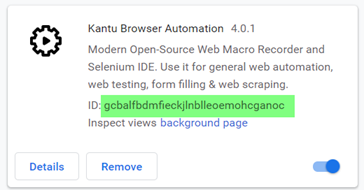 Xmodule for Chrome portable - General Discussion - Forum for Kantu Task and Test Automation and the free OCR API. Where I can put the Kantu folder to using with Chrome portable (Windows) or it’s not possible to using ? The Kantu folder can be anywhere on your machine. But we have not tested with Chrome portable yet - does the XModule installation work ok? Yes it does works fine with the normal Chrome installation but I can’t figure it out how to work with the portable one yet. Sorry my mistake here need to add more info here after some more tests with the normal addon installation works fine even with the chrome portable what don’t works it’s when I attempt to run with the manual installed addon makes any difference ? Manual install from the zip file provide don’t works don’t locate/don’t see xmodules installed and the normal addon installation works fine with chrome portable and see the xmodules installed. it’s when I attempt to run with the manual installed addon makes any difference ? Yes, that is the reason. Chrome (but not Firefox) generates a new ID for a manually installed browser extension.